Mission: We, the Roman Catholic churches of Holy Rosary, Miraculous Medal, and St. Patrick, enlightened by the Word of God, guided by the Holy Spirit, and called to spread God&apos;s love, through our actions and words, to bring into an intimate relationship with Jesus all those living in North Central Washington County. St. Patrick Parish and St. Genevieve Parish merged as Canonsburg was no longer able to support two independent parishes, to form a new parish, also named St. Patrick. St. Genevieve Church was founded in 1917 as a Polish parish. 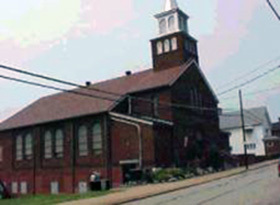 The origin of the parish can be traced back to 1907, when a large number of Poles began moving to Canonsburg to find work. Soon a significant Polish population grew in the community. Originally, the Poles attended St. Patrick parish. On March 9, 1911, the bishop gave the Polish members of St. Patrick permission to begin raising funds for a church and school of their own. In 1916, they requested permission to begin construction of a church, which was granted on September 1 of that year. Almost a year later, on August 23, 1917, the parish became a reality with the appointment of a resident pastor. While work continued on their church, the parish held Sunday Mass at the Polish Falcon&apos;s Hall. Finally, on September 5, 1922, the completed church was dedicated. As the growth of population at the beginning of the century led to the creation of the parish, the loss of population near the end of the century led to its suppression.